International development secretary Clare Short has reportedly accused France and the EU of a "conspiracy" to keep Africa in poverty. Ms Short is quoted in the Daily Telegraph newspaper as saying British-backed proposals to dismantle trade barriers between Africa and Europe were being undermined by French and EU protectionism. The newspaper says Ms Short's remarks risk undermining Tony Blair's efforts to build a diplomatic consensus on African development. 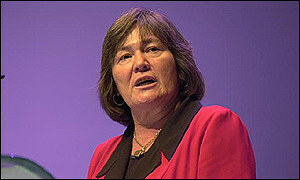 She is reported to have made the comments during her four-day visit to Africa with prime minister Mr Blair. Behind the scenes Downing Street is said to be frustrated by obstacles placed in the way of reforms by France. Mr Blair is attempting to gain French approval for his New Partnership for Africa's Development, which hinges on unconditional free trade for African nations. The plan will be raised at the next meeting of the G8 group of industrialised nations later this year. "The proposals have big power blocks in their way. Europe is a bag of tricks about this at the moment," Ms Short was quoted as saying. "It's a conspiracy from France and the EU to lock Africa into poverty, and at the same time Europe preaches free trade." France is still a major player in Africa and maintains strong links with its former colonies. Mr Blair and Ms Short visited Nigeria, Ghana, Sierrra Leone and Senegal during their four-day fact-finding tour. Asked to comment on Ms Short's reported remarks, Mr Blair told the Telegraph: "I don't want to get into a diplomatic row with France." "The official position of the British government is... extremely close to the French position"